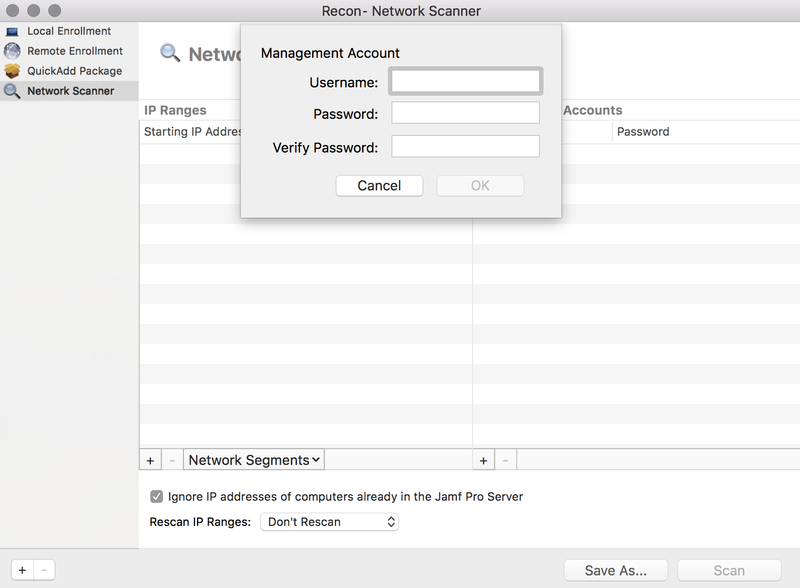 The network scanner in Recon allows you to remotely enroll multiple Mac computers. It scans specified IP ranges and enrolls any computers that it can connect to over SSH (Remote Login). There are two ways to specify the IP ranges you want to scan: choose network segments that are set up in Jamf Pro, or manually specify IP ranges. If you manually specify the IP ranges, you can choose a building, department, and site to add computers to during enrollment. To enroll computers using the network scanner, SSH must be enabled on the computers. Select Network Scanner in the sidebar. To choose network segments that are set up in Jamf Pro, click Network Segments below the list of IP ranges and select the network segment you want to scan. Repeat as needed. To specify IP ranges manually, click Add (+) below the list of IP ranges and specify information about the IP range you want to scan. Click OK and repeat as needed. Specify one or more local administrator accounts that have SSH access to computers in the IP range. When the network scanner finds a computer on the network, it tries each account until it finds one that can be used to connect to the computer over SSH. The first valid account is used as the management account. Click Add (+) below the list of accounts. Enter credentials for a local administrator account that has SSH access to computers. If there is more than one administrator account in the specified IP ranges, repeat steps a through c as needed. To ignore computers that are already enrolled with Jamf Pro, select the Ignore IP addresses of computers already in Jamf Pro checkbox. 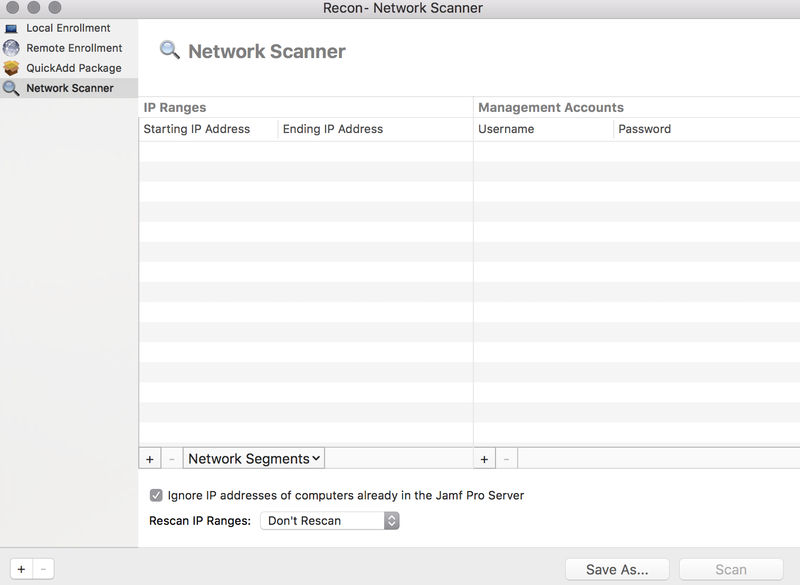 To continuously scan for new computers, use the Rescan IP Ranges pop-up menu to specify how often Recon should rescan. To create a .recon file that contains the network scanner settings you just configured, click Save As. Then specify a name and location for the file. 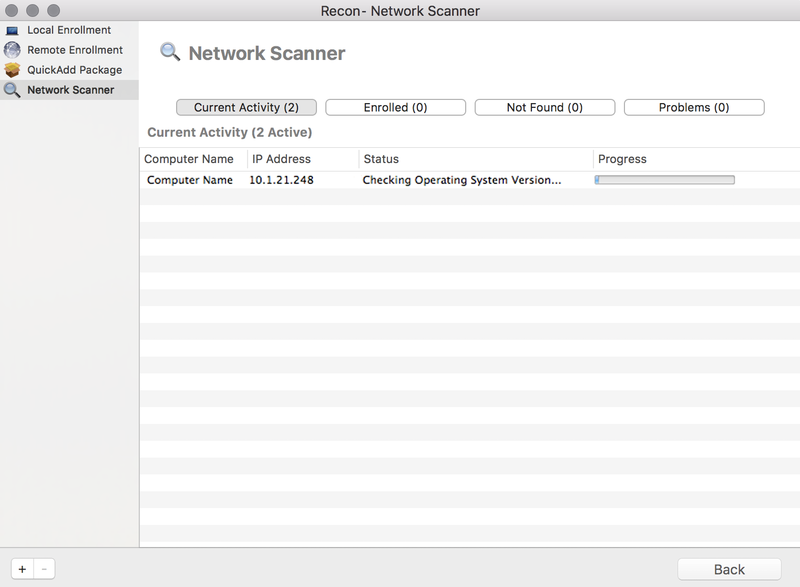 Double-clicking the file opens Recon (if it is not already open) and populates the network scanner settings. 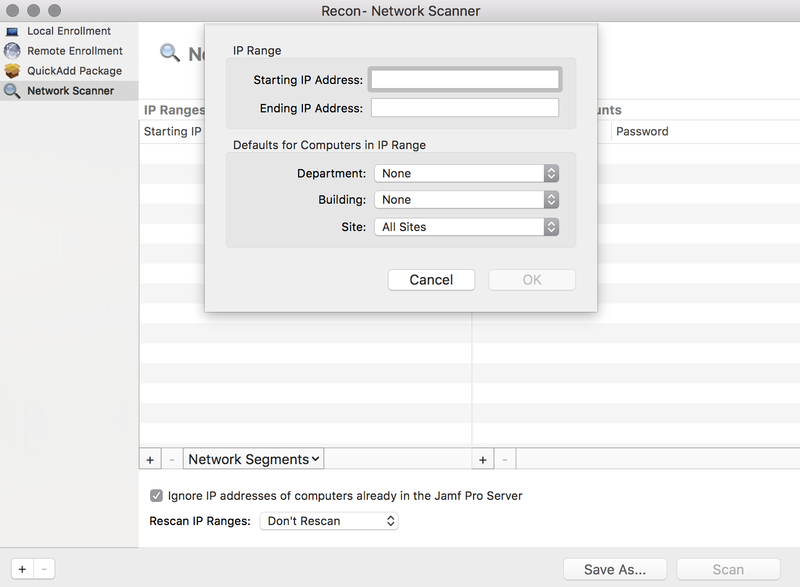 You can open the file at any time to have Recon automatically configure the network scanner settings. Recon scans the specified IP ranges and enrolls any computers that it can connect to over SSH. The progress of the scan is displayed on the Current Activity pane. The results of the scan are displayed on the Enrolled, Not Found, and Problems panes.